Metheny isn’t alone in that opinion and these two LPs represent some of Montgomery’s most sought after recordings. So word of a newly discovered Wynton Kelly/Wes Montgomery session was very welcome indeed. The label behind the find is once again Resonance Records who have, over the last few years, shown a remarkable talent for seeking out and releasing lost gems of jazz. The sessions that form the basis of this album were recorded at the Penthouse in Seattle, Washington on April 14th and 21st 1966. By that time Wynton Kelly’s trio had undergone one change in its personnel, Chambers had left to be replaced by Ron McClure on bass. The half-century old tapes have survived the years admirably unscathed and the sound quality here is live, dynamic and exciting. It might be expected that Wes Montgomery would be the headliner on this record — the title after all evokes his milestone Half Note album. But the procedure on those gigs back in 1966 was to have the Kelly trio open each evening, playing several numbers before Montgomery joined them. And Resonance have decided to reflect this by including four tracks (out of ten) of Wynton Kelly’s men without Wes. A risky move since the guitarist is the star here. Luckily, the Kelly trio material is excellent, vibrant and rollicking, and you wouldn’t want to miss it. Indeed, Wynton Kelly’s piano playing is so rich and musical the listener begins to forget that there are other instrumental possibilities; they certainly don’t seem necessary. There is No Greater Love is notable for the brisk, scampering freshness of his quicksilver piano and Jimmy Cobb’s solid chunking drums, with a spattering of cymbals. The up-tempo midsection of Not a Tear features swift, swooping runs which are reminiscent of Horace Silver’s Señor Blues. And If You Could See Me Now is a beautiful piece, with the probing persistence of Kelly’s piano decisively chipping away at the tune to reveal bright slices of melody. But then Wes Montgomery appears on West Coast Blues and we’re in a whole new sound world, funkier and fatter and richer. Jimmy Cobb’s drumming responds and rises to the occasion by becoming more punchy and Kelly impresses by seamlessly seguing into a comping role, closely configuring himself to the guitarist. Montgomery carves out big chunks of music with his characteristic chubby chordal playing. Jobim’s O Morro Não Tem Vez is a beautiful sunny bossa nova and Jingles has a thumping impact with piano, guitar and Ron McClure’s bass hitting in unison before Montgomery separates from the pack and unspools a long thread of a solo. In contrast, What’s New is slow and warm and intimate, the guitar as smoothly insinuating as a friendly cat, with Cobb making good use of the brushes and Kelly brightly constructing fills. This is an exciting and engaging release which again pulls off what is proving to be Resonance Records’ trademark trick — finding lost sessions by a major artist in one of their finest groups. I still suspect that there’s a case to be made for doing separate albums of the piano trio material and the guitar quartet, but whatever the configuration you don’t want to be without the music here. 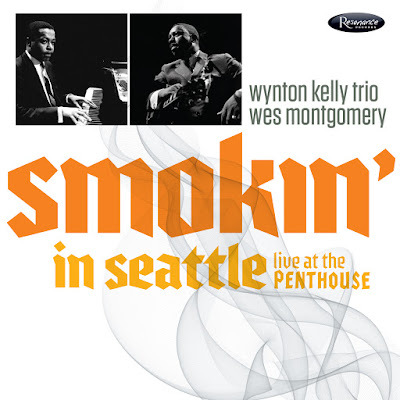 In 1966 Wes Montgomery was absolutely in his prime, but it’s the collaboration with Wynton Kelly which really puts him at the top of his game. Like Resonance’s recent Bill Evans LP (REVIEWED), this is a limited edition release, mastered by Bernie Grundman and pressed on impressively noise free vinyl by RTI. Smokin ' in Seattle will be released on April 22nd to coincide with Record Store Day. The CD version (HCD-2029) will be available in the UK and Ireland on May 19th.